A sentinel lymph node biopsy is an effective way to check whether cancer cells have spread to lymph nodes. After a sentinel lymph node biopsy, Premal Sanghavi, MD, FACS, can determine the optimal treatment plan for your particular case. Book an appointment online now at Dr. Sanghavi’s downtown Los Angeles and Glendale, California, practices, Premal Sanghavi MD, Inc., or call the office to schedule your visit anytime. A sentinel lymph node is the first gland that filters fluid draining from the breast. Since the sentinel node is the first lymph node to filter lymphatic fluid from the breast, it’s the one most likely to contract cancer if the cancer has spread to the lymph nodes. How is a sentinel lymph node biopsy done? A colloid is injected in the breast one day before or the day of the surgery in the nuclear medicine department. A blue dye is injected while under anesthesia. The colloid and the blue dye travel to the sentinel lymph node. The sentinel lymph node is blue in color and has colloid activity that is picked up by a machine present in the operating room. The sentinel node is excised and sent for testing. This is 98% accurate using both colloid and blue dye combination. What happens to my removed lymph nodes? After your sentinel lymph node biopsy, a pathologist examines your lymph nodes in detail to determine whether they contain cancer. 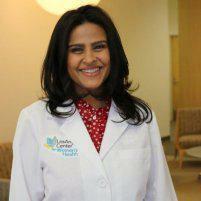 If your lymph nodes do contain cancer, Dr. Sanghavi discusses your treatment options with you. What is recovery from a sentinel lymph node biopsy like? Recovery from a sentinel lymph node biopsy is fairly straightforward, and in most cases, you’ll be able to go home the day of the procedure. Sometimes it’s necessary to remove additional lymph nodes under the arm if there is spread of cancer to the sentinel node. Axillary lymph nodes are divided into three levels of based on their location. The standard axillary lymph node dissection removes level I and level II nodes that are close to the underarm. The actual number of lymph node removed varies from one individual to another. Generally, between 10-30 lymph nodes are removed in the standard axillary lymph node dissection. For a skilled provider experienced in sentinel lymph node biopsy, call Premal Sanghavi MD, Inc. in Los Angeles or Glendale, California, or schedule an appointment using the online booking feature today.